The Pumpkin Patch Express pulls into the station, and riders retrieve their pumpkins. 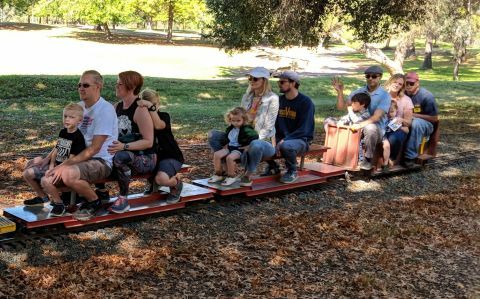 Rancho Cordova, CA (MPG) - At Sacramento Valley Live Steamers Railroad Museum (SVLSRM), a fully functioning railroad and steam engines are available for anyone to ride and enjoy. The main line is over 6,300 ft. and winds through trees, past water features, and over wooden trestles in a corner of Hagan Community Park in Rancho Cordova. The SVLSRM runs an annual Santa Train in December, but just started running a Pumpkin Patch Express train last year. The second year of this fundraising event was a great success, with many in attendance and long lines waiting for their turn to board the trains on October 6 and 7. SVLSRM is a non-profit organization completely run by volunteers. “We all have different abilities that make the club what it is today. From the machinist to the landscapers to those with a construction background and those that take care of us (feed us), we are one big family that enjoy sharing our hobby with those interested in trains and making this little piece of Rancho Cordova the best that it can be,” said Berchielli. Stephanie Huntingdale, one of SVLSRM’s many volunteers, said, “We’re a 501(c)(3), so every donation goes back into the museum to repair tracks and engines…It’s really a labor of love.” They ran three trains for this year’s Pumpkin Patch Express, but Huntingdale said they wished they had four because so many people came out for the event and the wait times were longer than expected. Two of the trains are owned by the museum and one was brought in by a member of SVLSRM. “We’re having a great time here with the kids,” said Doug Foster, who came all the way from San Francisco to bring his kids to the event. The mission of SVLSRM is to preserve the history, traditions, and lore of American steam railroading and nurture a love of trains in future generations. For more information, visit www.svlsrm.org.